We undertake house clearance in all areas of Amble: Acklington Acomb Akeld Allendale Allenheads Allerdean. Our client for this house clearance was the owner of a large detached Mock Tudor house in Amble. He and his wife had just moved to smaller property nearby as their children were now grown up and no longer living in the family home. He asked us to squeeze in a house clearance at short notice as he was desperate to get his property on the market as soon as possible, but it required a lot of work before he could start to arrange viewings. There were still furniture and general household contents to remove, and it also required a clean. We told him it was no problem to arrange a clearance at short notice, and we gave him an appointment within 48 hours. 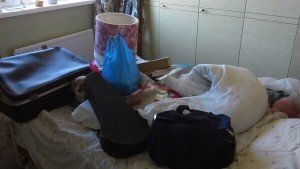 The client showed us around the house, telling us that he’d cleared all the family’s personal effects out, but asking if we’d look out for anything they might have missed. There were not as many items as we are used to in the largest house clearances, so this was a fairly straightforward job by our standards. We removed all of the large pieces of furniture, and then bagged up the smaller items. We worked quickly, taking the utmost care not to cause any damage to the property itself. In the kitchen we disconnected the washing machine, fridge, freezer and electric cooker and cleared out the old cabinets, which were beyond repair. We did find a cigar box jammed at the back of a chest of drawers. It contained some cheap costume jewellery, but one of our team also noticed a pair of earrings. They were mounted with diamonds and looked like they were Victorian. It was obvious that the client must have missed those, so we put them aside. We finished the actual house clearance ahead of schedule, and we then began work on the deep clean. It took a few hours to clean out every room in the house, but by the time we were finished it looked shipshape and ready for viewings. Most of the items that we cleared were in a relatively good condition, although they were not really suitable for resale, so we donated them to two local charity shops in Amble. We sent the remaining items to the recycling centre to be processed. We gave the cigar box and its contents to the client, and he was absolutely delighted. The contents of the cigar box had belonged to his grandmother and he hadn’t seen them for years. He thought they were lost for good.